There was a time when facial hair was not too important for most men, but that is changing. Beards have become popular and more complex over the last few years, which has made shaving not only a task but a work of art. The following are 10 important shaving tips that men should know today. Yes, the popularity of beards is growing, which is probably one reason why the workplace is now accepting beards, but this also means that your beard needs to look neat and acceptable. Some forget how important a beard balm or lotion can be, but it can help your beard in several ways. For example, it can help ensure that your beard looks healthy, shiny, and remains soft to the touch. You want to make sure your beard says the right things about you at work. It is very important that you prepare your skin and facial hair before you start shaving. Many men out there, you might know a few, just shave and skip this step. The reason you do not want to do this is because it can lead to irritation or a relatively uneven shave. Prepare your beard with pre-shave beard soap and warm water. You can also take a hot shower, or place a hot towel on your face for a few minutes. You are using hot water to soften up your facial hair and remove dead skin. A good beard requires tools, and you need to have the very best in your arsenal. For example, it is a clever idea to have a good shaving brush. These brushes can help spread the shaving cream, exfoliate the skin, and ensure that each facial hair is standing to ensure the closest shave. Another essential tool to have is a good safety razor travel case. There is no telling when you are going to need a touch up, so making sure you are prepared even when traveling is vital. There is no telling how a beard is going to grow in, and you need to be aware of your growth. You can do this by simply running your fingers in all directions across your beard. The direction of least resistance is the path you want to use when shaving that area. Shaving in the opposite direction or against the grain can lead to razor cuts or ingrown hairs. Most men know how sensitive the lip area can be when shaving. The lip area is sensitive enough that even the slightest cut could result in excessive bleeding. You want to be very careful when shaving around the lip area. Consider blowing your cheeks as if you were blowing air into something because this action expands the skin around the lip area just enough for you to cut a little more comfortably. Even professionals take certain precautions when shaving a client. You want to avoid cuts and irritating the skin whenever possible. One effective way to doing this is by making sure your strokes are short. The rule of thumb is that your strokes should not be longer than two inches. Remember that you need to rinse that blade every time you shave so that it does not clog up when shaving. You shave well, using all the right techniques only to find out that you missed a few spots, or the shave could be closer. Many will simply start shaving without lathering up. You do not want to be this impatient with your facial hair. Not only does lathering up ensure that your blade is able to cut easily, but it also prevents irritation to the skin. It is going to take a little longer, but your face is going to thank you. The neck’s skin is sensitive as you probably have heard or noticed. This means that it should be the last place that you shave. It gives the shaving cream enough time to work on the skin and your facial hair. Still, it is even more important for you to stick to the short stroke technique in this area. Many men feel inclined to shave in large strokes but avoid this urge. Remember to tilt your head back while pulling the lower part of your neck down while shaving to stretch the skin. You will want to soothe the skin, no matter how amazing your shaving skills are. Consider that the skin had to battle a very sharp knife. There is bound to be some irritation, so soothe the skin when you are done shaving. 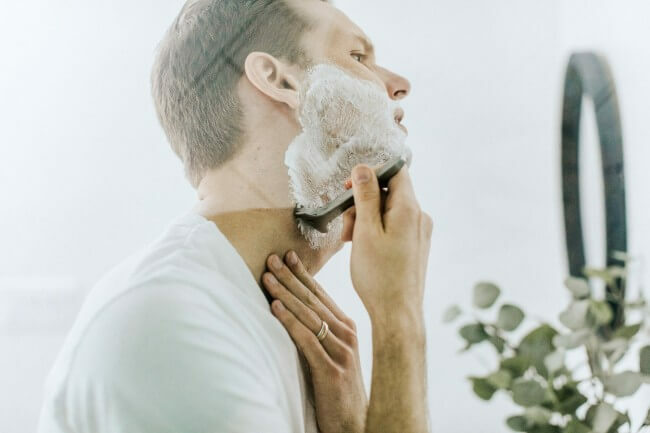 For example, some men blend a little tea tree oil with witch hazel together to soothe the skin, or just use a little fresh aloe vera gel when done shaving. You will effectively reduce the chances of rashes showing up later. The pores are still open when you are done shaving. This is a good thing while you are shaving but not afterwards. This look is not very attractive, so be sure to rinse your face with cold water when you are done shaving to close the pores. Finish off by patting the skin with a clean towel instead of rubbing, which could irritate your skin. Hopefully, these tips come in handy when needed. Remember to talk to your barber too as he or she will have some additional tips for you to use.